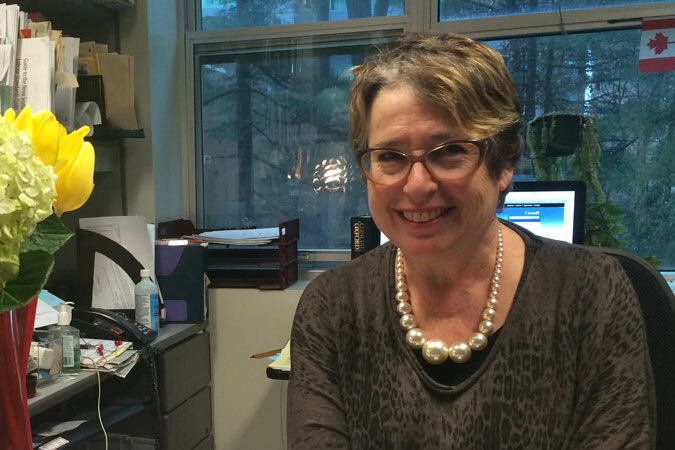 The Dalhousie dentistry scandal inspired the practice Judy Haiven has been using in her management classes at Saint Mary’s University since the first day of this semester: women speak first. “I told (my students), because of the dentistry situation, I’m trying an experiment,” Haiven said on Monday. “The dentistry scandal made me more aware of how women often don’t have as loud a voice as men, and the fact that with the dentistry scandal that men put out demeaning information and made terrible suggestions on the Facebook group, made me realize that we need to hear more from women, especially women in university,” she said in an interview Monday. She has tried her experiment in both of the courses she teaches. She calls on women first during a discussion or question period, and will ask the class if a woman would like to speak first, if only male students have their hands raised. The experiment also extends to group projects. Haiven said that group projects typically divided the work between men and women by having the women type up the projects and the men present it. During Dalhousie’s forum on misogyny on Jan. 15, more than 350 people attended the discussion of two panels. In the first panel, Haiven told the attendees about her classroom experiment. The story UNews posted about the forum has sparked a debate in the comments section, and on social media. Some commenters claim Haiven’s practice is an example of “misandry,” or the hatred of men. Others blame the practice for feminism’s bad reputation. Haiven printed some of the comments from the article off, but hasn’t read them. Haiven said she hasn’t gotten any negative feedback from students in her classes, but when she first introduced the practice, many seemed nervous. The women may have felt “put on the spot,” she said. A faculty member from another department at SMU told Haiven there were negative responses on Facebook to her idea. Haiven said she thinks the negative responses are because it’s a new idea. Haiven says she hasn’t figured out how her experiment applies to people who identify as trans, or who don’t identify with a particular gender. She also hasn’t determined how race should play into it. 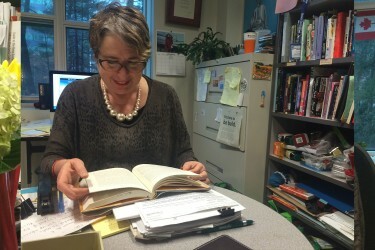 The rest of her department has not followed suit, nor has any other department at SMU that she knows of, Haiven said. What if the men self identify as trans-female? “Men” don’t identify as trans women. Trans women are women. One would think this is relatively straight forward. Considering everyone usually puts their hands up to speak or to start a discussion in class (in my experience), I don’t see how it’s possible for the questions/ comments of any particular group of people to go repeatedly unheard in her classroom unless she specifically wanted them too. She was the one that chose who spoke first. Why announce her discrimination? Everyone pays the same amount for those courses, hopefully there’s a university policy that will quickly set this one straight. People go to university for an education. Not to be involved in a nonconsensual experiment and “learn” in a state of inequality. This is ridiculous. This reminds me of an experiment where kids were being disadvantaged or advantaged in small minor ways like a little extra positive attention based on something arbitrary (eye color). Very soon those that were advantaged started performing better on tests and those disadvantaged started performing worse. Schools and universities are continually being made more male-unfriendly. I’m glad that I have my degree, but my heart goes out to the guys who just want to get an education nowadays. Why not round-robin or alphabetical? Was it even necessary for her to divulge her ‘experiment’? It seems to me that she announced this for publicity and support regarding something she could easily alleviate by just picking a female to discuss the points. When I was in school we were called on without raising our hands because when life asks a tough question it doesn’t wait until you’re ready to answer. It’s highly unfortunate that this “experiment” which Ms. Haiven has chosen to conduct will have actual, real world consequences. Since she’s chosen to ignore individual comment on the matter, I’m certain that my response will fall on deaf ears, or be excluded or “moderated” from this article (in which case, I will simply create my own forum to publish my thoughts). This, for myself, is a bit of the straw that broke the camel’s back. I’ve been around the block, both academically and in the real world. During my tenure as a student, during my career, and especially now during my successful years as an entrepreneur, I’ve been a proponent of equality. I’ve not done this from a feminist approach, as feminism has absolutely nothing to do with equality. Feminism may speak to such things, but in reality, as Judy Haiven is demonstrating, Feminism is at it’s base, a movement which intends purely for the advancement and advantage of women, at the expense of men’s rights. This has been demonstrated time and time again in Canada through legislation and legal appointment. Feminism is an opportunistic concept. Those who truly believe in equality are able to achieve their goals through their individual merit, and have done so successfully time and time again. Perpetuating the advancement of women, while waiting in the wings for opportunities to do so is radicalism, a form of terrorism, and not least: contrary to the very charter rights which have been designed to protect said “Special Interest Group”. Judy Haiven may well believe that such petty principles will most likely bring many new feminist minions to her side. This will more than likely be the case, satisfying for her a need to feel loved, accomplished and as someone who has achieved something in her otherwise generally meaningless existence as a professor in the halls of academia. Personal insecurity runs rampant in this movement, hence the need for collective action. Unfortunately, one tends to feel a false sense of security as an academic; extolling pure idealism, and in this case radicalism; an interesting exercise in theory. Unbeknownst to those who design, engineer and bring to fruition such concepts, there does exist an opposite reaction to these events. Something called “Accountability”. 13 students chose to engage in a private, stupid, irresponsible exercise in the form of electronic media. Judy has chosen to seize this moment as a perfect platform and opportunity to try to gain the upper hand in what she deems to be what is essentially a class struggle. She and her supporters have taken this opportunity to accelerate their own agendas. Make no mistake about this; this is not about equality. This is purely about Ms. Haiven’s desire to accelerate women’s rights above and beyond that of men’s rights. This is a quest to satisfy and remedy personal insecurity, not a gesture speaking to real world events. Again, unfortunately, there is accountability for this, and consequences in the real world. The silence from senior academia on her ideas is intolerable. She does not belong in a position of influence, and certainly not in one where she garners a wage from tax-based and tuition based support: monies collected from men, as well as women. As a successful entrepreneur, I currently have eight women in my employ, out of a team of 19, excluding myself. Thanks to Judy Haiven, this number will be reduced to zero. None. Radicalism can be countered by radicalism, as has been shown time and time again in countless historical instances. I am fully free to hire who I choose in the real world. Any graduate of Dalhousie’s fine halls will no longer be welcome to make a living from my own hard-earned income, ideas and creative thinking. I will not have someone’s personal insecurities shoved into my existence under the guise of equity law. Ms. Haiven has created an adversary with her exercise, one who she would have had as an ally, should she not have been so opportunistic. Two can play the game of “upper-hand”. I am no more willing to hire and support an individual who’s radicalism is completely contrary to my well-being, and that of men, nationwide, than I am to hire the likes of the 13 individuals who were stupid enough to carry on in such an undignified manner. Well done Judy. In the real world, you’ve just cost eight women their jobs, and there is nothing you can do about it. Nothing. I will also take issue with your ridiculous standpoint amongst my peers. I’m well respected in my field, and when I break my argument down using logic, a concept that escapes you and which you are barren of, I’m more than certain that they will be in agreement with me. Enjoy your 15 minutes of fame: those minutes have accountability, and the manner in which you have chosen to embrace them has now bred real world consequences. The only thing that will satisfy the Social Justice Warrior class will be a two-state solution. What’s impressive about this is that one professor in one university sparked a gender debate by letting women speak first, when only 4.6% of Fortune 500 CEOs are women, when gender representation in Canadian politics and among policy makers is an issue, when just the gendered toys we receive as children discourage women from pursuing STEM careers by highlighting beauty and domestic-activities, when our whole entire society was formed in Men’s image and empirical evidence for gender-related pay gaps still exist in Canada…not to mention the unjust subjugation and oppression of women in other countries around the world…but this one professor’s “misandric” policy got people talking about gender inequality? I thought this type of sexual discrimination was illegal? This is misandry, it is not equal. You dont satisfy discrimination with the opposite version of the discrimination, you make everything about it equal. This is ridiculous.